Financial Services companies and lenders can start identifying more profitable customers by accessing 30% of US adults that are invisible to traditional screening services. Make smarter lending decisions, lower high loan rejection rates, reduce fraud, and start saying “yes” to more creditworthy borrowers. Why are you rejecting expensive applicants, sometime as high as 70%, when you could be accepting up to 20-25% more good customers? Our proprietary AI techniques help to analyze rejected financial applications for overlooked indications of creditworthiness, enabling you to say “yes” to profitable applicants you would have otherwise have rejected. Identify more consumers and gain a more complete financial picture by leveraging AI predictive analytic techniques to unlock alternative data. Our platform leverages unique data that is uncorrelated to traditional sources, enabling lenders to identify 20-30% more creditworthy thin-file and no-file borrowers. Lend with the confidence of Explainable AI to interpret credit decisions. By leveraging Explainable AI techniques and FCRA data from Credit Reporting Agency partners, our service separates the signal from the noise to deliver insights that are predictive and interpretable, giving lenders the confidence to make and explain credit decisions while supporting fair lending regulations. With innovative credit risk and identity services, Accelitas can help you gain access to more underserved consumers. By supporting frictionless mobile experiences and delivering a complete picture of a customer’s creditworthiness, we can expand your reach into unbanked, underbanked and digital-first populations, helping your organization achieve its goals for profitability and financial inclusion. Now every company can open their business to more digital and mobile customers. Our AI Extract web service seamlessly reads customer data from a photo of government-issued IDs such as driver’s licenses and passports, extracts barcode and text data, and uses extracted data to auto-form-fill account applications for a frictionless experience. 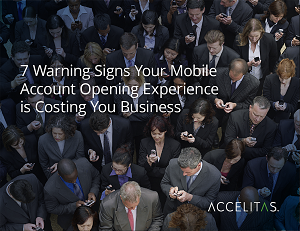 Reduce mobile fraud and abandonment without compromising your customer’s experience. Just add a Social Security Number to our Mobile Account Opening service and you have a real-time verification solution that is fast, accurate and affordable.